A picture has surfaced on Reddit of what appears to be of a reference design Nvidia GeForce GTX 1060 graphics card. 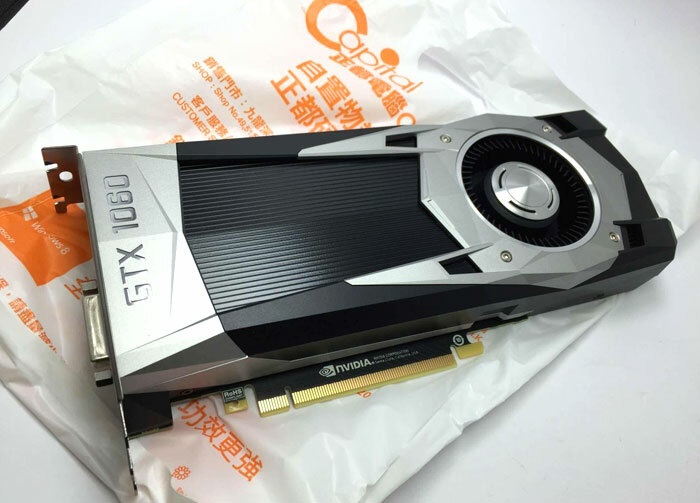 The graphics card is posed upon a crumpled Capital Computer Centre plastic bag, and Capital has responded to the publication of the photo by saying "LOL". The picture of the GTX1060 shows what looks like an Nvidia reference design with the cooling shroud using the same angular design language implemented on 'Founders Edition' GTX 1070 and 1080 cards. Looking more closely at the photo, the PCB looks like it is only about 70 per cent as long as the whole graphics card with the cooler shroud extending beyond it. The array of output ports on offer and the presence of power connector can't be seen. Previous leaks/hints at the Nvidia GeForce GTX 1060 existence pointed to this graphics card using an Nvidia GP106 GPU. This is a GPU which is also leveraged by Nvidia's Drive PX2 autonomous car development platform. A shipping manifest last month indicated that the GTX1060 would use a 256-bit memory bus, with 4GB or 8GB of high density GDDR5. However more recent chitter chatter suggests that Nvidia will be releasing these cards with either 3GB or 6GB of RAM onboard. Performance should be somewhere between the last gen Nvidia GeForce GTX 970 and 980 graphics cards. With the AMD Radeon RX 480 imminent it would make sense for Nvidia to at least paper launch the GeForce GTX 1060 to get folks to hang on for its $199-$299 Pascal-based response. This is certainly an interesting time to be in the market for a mid-range graphics card.